We are pleased to announce the release of Simplicity Linux 16.04. Due to a hard disk failure on our production machine, it has been released a little later than we would have liked. As with recent versions of Simplicity, it is based on the excellent LXPup and uses LXDE as the desktop environment. Mini and Desktop come with the 4.0.4 kernel, and X comes with the 4.4.5 kernel. As with our previous releases, Mini (Previously Simplicity Linux Netbook Edition) is our heavily cut down version. It comes with Flash preinstalled, the latest version of Firefox, and web versions of Spotify, Dropbox, Gmail, Google Docs and many other applications. Desktop is our fully featured distribution, based on the same base as Mini but rather than web based applications; it comes loaded with Flash, Firefox, Thunderbird, LibreOffice, GIMP, and Mplayer. Also in this release, you can test our most experimental version of Simplicity Linux to date, X 16.04 dubbed as NX. This version comes with a warning as it is still in the very early stages of development. It comes with the 4.4.5 kernel, but it is an x32 64-bit kernel. NX has successfully booted on a 64-bit virtual machine and we were quite pleased with the results, although we have not yet tested it on a physical machine. X should not be considered finished or complete. However it is a sneak peek at a direction Simplicity Linux may move towards in the future, and we’d love for our users to try it out and let us know what you think. NX è la versione sperimentale con kernel a 64 bit. 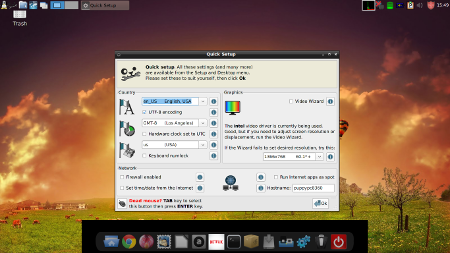 Leggi tutto: Quirky 8.0: "Xerus"
Quirky Linux 8.0 is released. This is codenamed “Xerus”, as it has binary compatibility with Ubuntu 16.04 64-bit package repositories. This means that Quirky is able to install DEB packages from these repositories. Other than that, Quirky is in no way similar to Ubuntu! 8.0 has Linux kernel 4.4.7, SeaMonkey 2.40, and a host of applications to fill every need. As per inheritance from Puppy Linux, Quirky includes the “kitchen sink” in a very small download. Significant new features for 8.0, in no particular order, are BluePup GUI management for Bluetooth, the ISO now boots on UEFI-firmware machines, YASSM GUI to manage Samba, YouTubeDL GUI youtube downloader, and many applications updated. And, as usual, a multitude of bug fixes and little improvements. It’s that time again! A new release of Simplicity Linux is available for download. Simplicity Linux 16.01 comes in two flavours, Netbook and Desktop, both 32-bit releases. Based on the excellent LXPup distro, we use LXDE window manager and 4.1.6 kernel. For those Simplicity Linux virgins, Netbook Edition is our cutdown version using web based software rather than installed software which means you can keep all your data and satisfy all your computing needs in the cloud. Cloud computing FTW! On the other hand, we have Desktop Edition which is a lot heavier but comes pre-installed with great software like Audacity, LibreOffice and GIMP. Both Editions come with the latest versions of Google Chrome. To protect your privacy, in place of the TOR Browser we included in the previous version, we have installed the DotVPN plugin on Chrome. It’s an excellent option to protect your privacy and it’s entirely free to use out of the box. We have also included two of our favourite plugins AdBlock Plus and LastPass. We look forward to receiving your feedback and we hope you enjoy using Simplicity Linux 16.01 as much as we’ve enjoyed working on it. Questa versione è nel 7° anniversario dalla nascita della distribuzione.